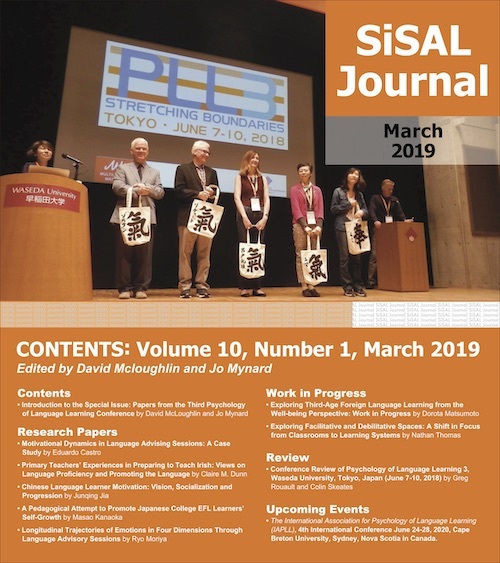 Call for Papers: SiSAL Journal is planning to publish a special issue on selected papers from the Japan Association for Self-Access Learning (JASAL) 2017 Conference in June 2018 (Volume 9, Issue 2) edited by Hisako Yamashita, Clair Taylor and Andy Tweed. The deadline for submissions from presenters or participants is March 31st 2018. The Japan Association for Self-Access Learning (JASAL) is a non-profit professional organization devoted to promoting self-access language learning in Japan. Its annual conferences have provided opportunities for members to share ideas about self-access language learning, running self-access centers and developing learner autonomy. In this special issue, we will have selected papers from the JASAL 2017 Annual Conference which was held on December 16th, 2017 at Kanda University of International Studies in Chiba, Japan. “Enriching Self-Access Environments” was the theme of JASAL 2017 conference. Self-access environments need to be carefully designed in order to provide learners with the flexibility to explore resources and opportunities for learning. In Japan and in other countries around the world, we have a great variety of self-access environments, and many factors influence these. Learner populations and their needs, the availability of financial and human resources, the goals of the institution, and the beliefs of administrators, staff, learning advisors and teachers all influence what is provided in self-access environments. The editors invite submissions from JASAL 2017 presenters on their creative and or innovative practices to enrich their self-access environments, which they presented at JASAL 2017. Non-presenters can also submit their reviews of JASAL 2017 or reflections on the conference. The papers can be in English or Japanese, but we ask contributors writing in Japanese to submit their abstract in English as well.